Suitable for events with 25-50 women! A sampling of Leslie Ludy’s books for your simulcast event! Ideal for a small event for 25-50 women. 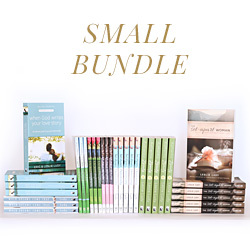 This bundle includes 36 books total ($9.25/book). *Please note: Leftover items may not be returned. Please estimate for your group's needs to the best of your ability.